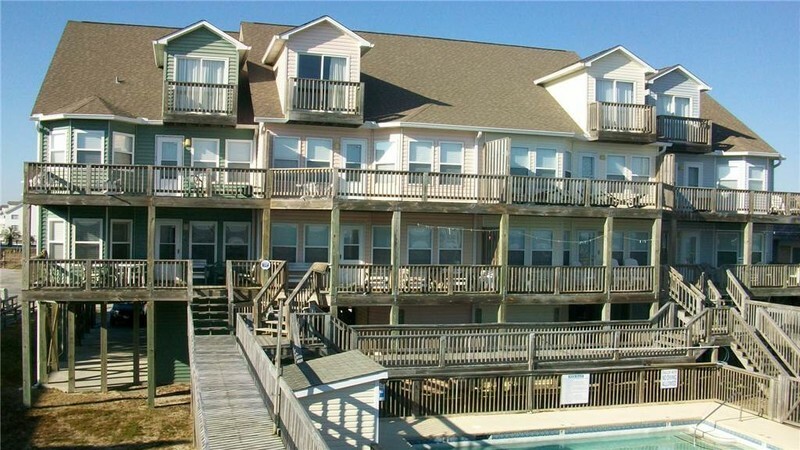 Remodeled Oceanfront, 7 Bedrooms, 7.5 Baths quadplex (this is the end unit) at the popular "Rainbow Row" - a landmark on OIB. Every bedroom has its own bath. Main living level features kitchen with wet bar, wine cooler dishwasher and microwave. Dining and living room open on to outdoor oceanfront deck. In home washer & dryer. Main family room, master bed and upper level bedrooms have TV's and DVD players. Oceanfront master suite with a King bed, TV and oversized bathroom. Third floor with vaulted ceiling has 2 double beds, private bath. There is a game room with reading corner and seating for fantastic ocean views. You will be eye level with the the pelicans that pass by in single formation in afternoon. Shared Swimming pool with the quadplex. Outside Shower, charcoal grill, sundecks and covered porches. Bedding: Downstairs: Queen, Queen Upstairs: King, Queen, Queen, Queen. 3rd floor Loft: 1 Double, 1 Double in a separate area from room. All beds made upon arrival and bath linens provided for your stay. This is a non-smoking home. June 1-8 reduced by $1250. Save BIG on this early June week. Just $3975 for the week. Save $450 for prime June weeks (June 8 or June 15). Just $4750 per week.